As the conflict in eastern Ukraine has grown increasingly entrenched, the need for mobility has decreased, leading to a necessity for greater lethal capabilities with static weapons. This shift has led to local development of arms in an attempt to address new needs. The motivation behind this development is ostensibly to offset failures of outside supply to adapt to the entrenched stalemates along the front lines. Equally important, however, is the propaganda value that comes from local arms production, as seen in how separatist media has touted one-off or small batch production as products of their “military-industrial complexes”. However, the reality remains that these developments have had little tangible impact on the battlefield, especially when compared to their public relations value. @DFRLab previously covered arms improvisations on both sides of the conflict. In this case, we measured the relative battlefield impact compared to the narrative impact of local weapons development by separatists. The general trend in small arms production has been the notion that bigger is better, and that mobility is overrated in a war fought between entrenched positions. The emphasis has been, for the most part, placed on range, power, and accuracy instead of mobile volume of fire, which had more importance at the outset of the war in spring 2014 until the Battle of Debaltseve in early 2015. Some exceptions to the rule do exist, one being the locally-produced pistol “Oplot”. A more common exception is the production of improvised suppressors, which not only lower the volume of the gunfire, but also help conceal the location of the shooter. In a video unveiling the Oplot, separatists show off the “military-industrial complex” facilities at an undisclosed, seemingly untraceable location. The facility featured several assembly stations, as well as CNC machinery and mills to produce the parts for the pistols. The fact that Oplot is a pistol is not all that makes it unique, as it is also by far the most complex weapon to be produced from scratch by Russian-led separatists. It is certainly likely that this facility could be in or around Donetsk, as it was a highly industrialized city before 2014, but it’s unclear whether the special skillsets that go into designing and producing a weapon of this complexity are still available locally. 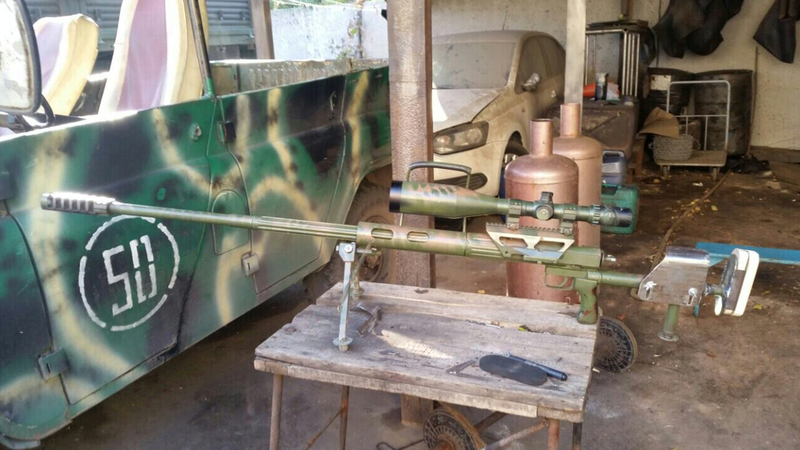 The more well-known locally produced arms are anti-materiel rifles designated as counter-sniper rifles. While these arms are more powerful than the Oplot, they are also much less complex in their firing mechanisms. The popularity of these arms is a product of the circumstances in which the opposing forces find themselves. Sniper fire, along with indirect fire, remains one of the greater concerns of troops on the front lines. The Donchanka is a single shot, 12.7x108mm (.50 caliber, not to be confused with .50 BMG) rifle, which was first unveiled in October 2017, but was later rebranded as a response to United States arms supplies to Ukraine. The Donchanka bears a strong resemblance to the PTRD-41, an anti-tank rifle from World War II chambered in 14.5mm, which likely had a strong influence on the design of the rifle. According to separatist sources, the initial version used the barrel of the NSV-12,7 heavy machinegun, but later on separatist engineers developed the capability to produce their own barrels. Both the PTRD and its semi-automatic cousin PTRS are already used extensively on the front lines by separatist forces. In a different image of the Donchanka, a non-suppressed version is displayed with a barrel shroud, and in front of a vehicle of the so-called Donetsk People’s Republic’s 100th Brigade “Kupol”. Both known versions of Donchanka have side mounts for Soviet style optics. Another much heavier counter-sniper weapon is the “Separatist”, a more recent development which is far cruder than the Oplot and Donchanka. The Separatist is a converted 23mm anti-aircraft gun, repurposed to fire from a tripod. More specifically, the Separatist is a 2A7 / 2A14 (likely taken off a zu-23–2) which appears to have been converted for single-shot fire, meaning that a new round has to be loaded into the chamber manually for every shot fired. The tripod features a solid mount for the receiver of the “cannon” as well as a mount for a scope which almost certainly does not have the correct ballistic values for a 23mm round, which would be where the explosive power of the round would come into play. There are several pictures online of the “Separatist” in various stages of development, but it is likely a one-off model. The 23mm anti-aircraft round is popular in small wars across the world, but mostly for its role as ammunition for the ZU-23–2, which is often mounted on vehicles to provide mobile high-volume firepower. It is for this reason that this round was repurposed for single-shot use, as it has limited value as an explosive device compared to more conventional alternatives. Nonetheless, separatist forces appear to be repurposing this common round for single-shot usage, as the mobility of vehicle mounted ZU-23–2s loses value, and air defense no longer has the same urgency as before. The above video shows an AK-74 with a custom-made cylinder at the end of the barrel, replacing the conventional AK-74 muzzle brake. The cylinder was made to accommodate for 23mm anti-aircraft bullets, which were to be propelled by blank 5.45x39mm rounds chambered manually in the rifle. The idea was that the 23mm round was to be propelled in the general direction of the enemy, and then explode at some point. This setup is similar to the first conceptions of rifle-launched grenades, which were largely replaced by under-barrel launchers due to the impracticality of having to manually load blank rounds. Indirect fire capabilities are growing increasingly relevant in the Donbas, as the enemy is not always visible and is usually behind fortified positions. Separatists already have an extraordinary amount of artillery of all calibers. These developments, if sustained, would delegate more firepower directly to lower-level units. One such development, as shown above, is a mortar round developed for 60mm mortars — an unusual bore size in this conflict. The mortar’s ammunition is based on the Soviet F-1 hand grenade, the diameter of which necessitates a mortar tube of that caliber. The F-1 is a standard hand grenade in the conflict in eastern Ukraine, but is meant to be propelled by hand. With the way that the round works, the pin of the grenade must be pulled before being dropped entirely into the tube, which holds the “spoon” in place to prevent the grenade from detonating. The grenade is armed as soon as the grenade exits the muzzle of the mortar and detonates after a set amount of time. While this round may have some use, at least because of its potential as a Minsk-compliant weapon, it is also incredibly crude. What’s more, it leaves one wondering what would compel the creators to develop and manufacture such a weapon when Russian-led separatists are not known to suffer from ammunition shortages. 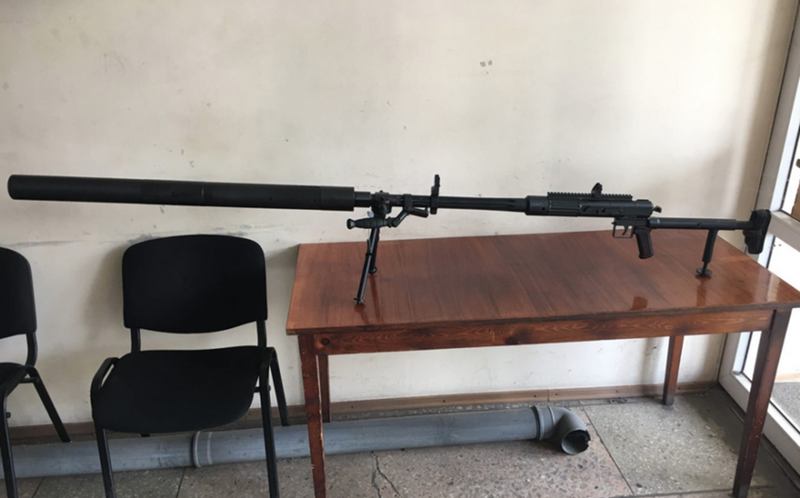 In a “response to Barretts and Javelins” from the United States by Luhansk-based separatists, the popular RPG-7 was mounted on a tripod in an apparent attempt to repurpose it into a type of rocket artillery. 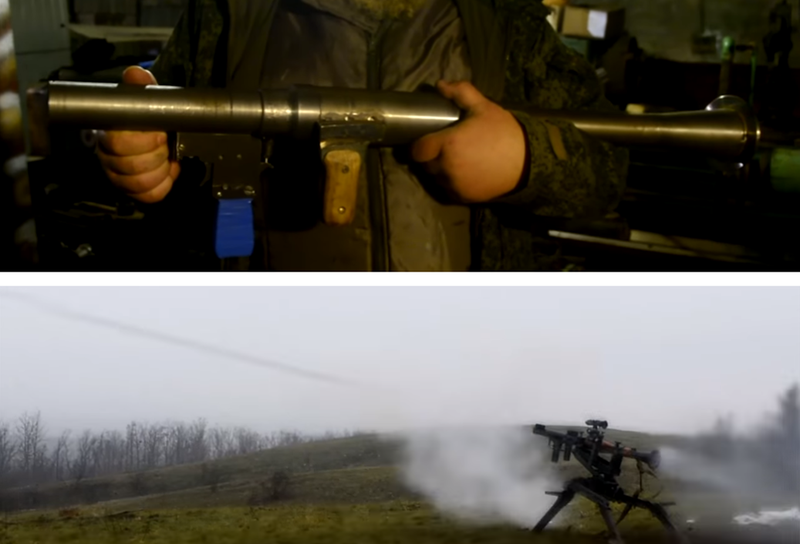 The video detailing its production shows a crudely produced RPG tube in a workshop, but the clips of test-fires only feature RPG-7s made in professional factories. If nothing else, there is interesting innovation surrounding the small arms development in separatist-held Ukraine. The “Oplot” pistol could be a testament to the ability of separatist leadership to buy custom-made weapons from Russia at worst. However, it could also be proof of advanced capability within separatist territory to produce arms. Even if we were to accept the hypothesis that separatists have advanced capability to produce arms, the question of capacity arises. While the Oplot was clearly a piece of precision engineering, other designs appear far cruder and likely come from other workshops. The workshop in the Oplot video was also barely staffed, further raising questions about separatist capacity to produce arms in Donetsk. Most likely, the real utility in producing such arms lies in the morale boost that local production gives to the population, and troops in the separatist militias. Not only are these arms unlikely to have significant impact in the capability in the weapons produced, but also in terms of the amount that can be produced, due to restricted production capacity. What’s more, most systems are heavily based off existing designs, many relying on pre-manufactured systems to function. Ambitious claims of a “military-industrial complex” in Donetsk are, by all indicators, overstated, but it is clear that there is some actual local production of new arms. Michael Sheldon is an editorial intern at the Digital Forensic Research Lab (@DFRLab).